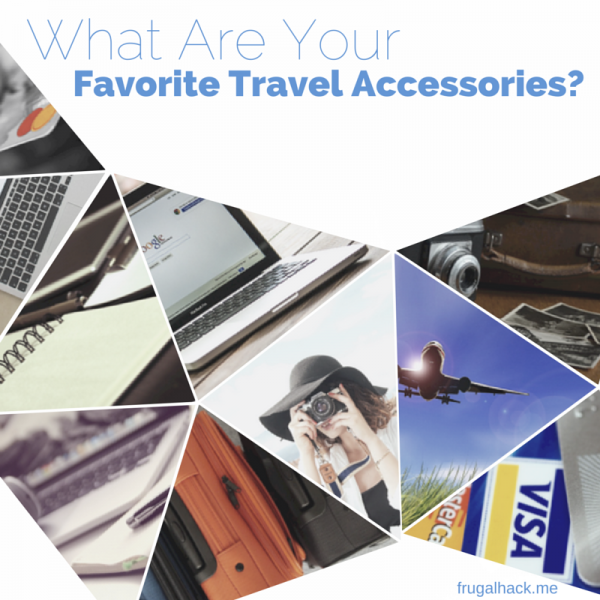 » What Are Your Favorite Travel Accessories? I talk about manufactured spending and travel a lot, but what I haven’t touched on much is the accessories that make travel easier. Obviously, what constitutes a necessary travel accessory will vary by person, but that’s why I’m asking, “What are your favorite travel accessories?” I have a few, which I will list in a minute, but I’m hoping you will have some suggestions for me to make my travel and other reader’s travel easier. WARNING: There are affiliate links in this post that may try to jump out at you. If this occurs, please turn back and never visit this post again. I am not liable for any shopping you may or may not commit by clicking on one… 😉 All kidding aside, I do really appreciate when you use my links! Luggage is super important when flying thousands of miles at a time. For one, you want it to hold enough clothes, soap, electronics, and whatever else you stuff in it. For two, you want it to hold up to constant handling, because you don’t want to buy a new piece of luggage every trip. And for three, you want it to be easy to maneuver. It can be expensive to buy quality luggage, but it’s worth the price in the long run. Also, if you’re in the market for new luggage, you should know what to look for. I never leave my house without a computer, tablet, phone, or other internet device. It’s just impossible for me to be disconnected at this point in my life, especially when I’m on vacation. I use my computer for everything from finding a good restaurant, to finding directions, to posting pictures on Facebook (very important, I know), so it’s something I could never leave behind when traveling. I’ve tried just bringing a tablet, but for me that just doesn’t work. My travel computer of choice is a Macbook Air . It’s light, very portable, and it runs on OS X, which is my OS of choice. I’ve heard great things about the Surface Pro 3 , but I have never had the desire or the will power to switch. Bringing a camera on vacation is a no brainer. How else are you supposed to take a selfie next to the pyramids in Cairo or Instagram your pizza in Naples? I am far from a professional photographer and I don’t like lugging around thousands of dollars worth of equipment on every vacation, so I ended getting an all-in-one. By all-in-one, I don’t only mean a point and shoot. I mean a rugged, shockproof, waterproof, freezeproof, beast of a point and shoot, Olympus TG-3 . I think I may have just oversold that camera, but really it’s sweet. There’s no case necessary to waterproof the camera and you can purchase extra lenses for it that are also waterproof. It’s pretty slick. I chose it over a GoPro , because I really like having a nice vibrant screen to look at and the option to use other lenses. Yes, I am a 22-year-old male that loves to play his game boy … It’s one of the best ways to pass the time on an international flight, trust me. The funny thing is that I have the Pikachu version of the 3DS, which tends to earn a lot more glances than the plain colored ones. With the amount of electronics I bring with me when I travel, I must have a backup battery . In fact, I usually bring two – one for me and one for my wife. If you want to buy a backup battery, I highly suggest the one I linked to above. It can hold 10000mAh which can usually charge my phone 4-5 times. Converters are becoming more and more obsolete, because many newer electronics have them built-in nowadays. However, I still have a few electronics (e.g. my 3DS) that can only charge via a 110V plug, so I bought an international converter/adapter to be able to charge everything. Gotoob travel bottles are a bit on the expensive side, but they’re awesome. They are 3oz squishy bottles that can accommodate any type of liquid. Also, they’re TSA approved, so you simply fill them up, stick them in a ziplock, and call it a day. Being a miles and points aficionado, I have to bring multiple credit cards! I usually bring two Visa cards, one MasterCard, one Amex, one Discover, and one debit. That way I cover all my bases and I have multiple backups if one gets lost or stolen. Since I bring multiple electronics, that means I have to bring a lot of cables and charges also. Fortunately, there’s an easy way to keep all those cords organized, called Grid-It . Grid-It is an awesome little square that easily holds all of your cords, chargers, backup batteries, and whatever else you want to put in it. It’s my favorite way to stay organized when traveling! Most hotels, restaurants, and even cities offer free wifi, but there’s guaranteed to be a time when you’re without it while traveling. That’s where Tep comes in. Tep is an international hotspot that you can bring with you to provide data access anywhere. I consider it invaluable. So, now that you know my favorite travel accessories, what are yours?